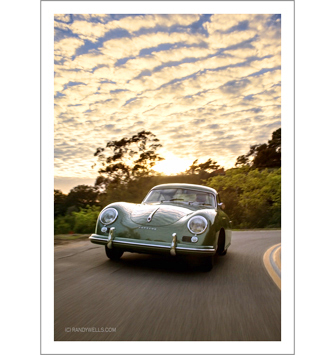 It was a pleasure getting to know Bob Heintz and his 1955 Pre-A Porsche 356. Bob restored this rare “Continental” model to perfection in its original Jade Green Metallic paint. It’s a gem that has gone on to win numerous concours. What a fun day it was canyon carving above Santa Barbara in this “time machine”. 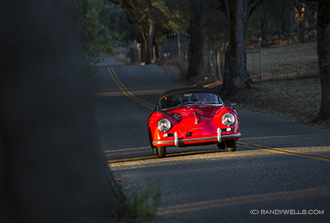 Photographing and writing about this jewell of a 356 was a blast too! Watch for my feature in the next issue of Excellence Magazine. Safe and happy 4th of July to all! Today is the final day of autocross competition at the 60th annual Porsche Parade in French Lick, Indiana. Good luck to all my PCA friends! In Colorado, the 93rd Running of the “Race to the Clouds” is in qualifying mode. Pikes Peak Hillclimb champions Rhy Millen and Jeff Zwart are there. Zwart is running second behind Millen’s electric vehicle in his Porsche RSR GT2. Conditions are the best he’s ever seen! Porsche Team’s 919 Hybrid #19 won the world’s greatest endurance race today with Nico Hulkenberg, Nick Tandy, and Earl Bamber driving at the French venue. This is Porsche’s 17th overall Le Mans victory. 919 #17, which was on pole with Mark Weber, finished second. Audi had to settle for 3rd after dominating this event for years. Patrick Dempsey’s 911 RSR #77 finished 2nd on the LM GTE Am class podium with Marco Seefried and buddy Patrick Long sharing driving duty. Congrats to all! A new Porsche shop is about to open on San Juan Island, WA. The man of the shop? Kevin Watts. A Scot who’s one of the sharpest guys I know. Thanks, everyone, for your gracious hospitality. It’s no secret. I’ve always wanted a 1954 Porsche Speedster. It’s the first year of an iconic shape that’s become an classic in automotive history. At least I’ve had the opportunity to photograph and drive one. My images of Bruce Ungari’s PCA Parade concours winning example are now on view in an article Peter Linsky wrote for the latest issue of Excellence Magazine. Enjoy.